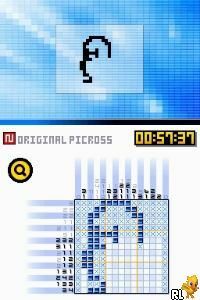 Picross is essentially a "nonogram" type puzzle game (also known as Paint By Numbers or Gridders). Basically, you have to fill in specific squares on a grid; the only problem is that they aren't always obvious. Numbers on the rows/collumns of the grid tell you how many squares to fill in. Using the process of elimination, you have to figure out logically which squares are and are not supposed to be filled in. This is made easier with a tool that lets you cross-out the squares that don't belong. If my description seems very confusing or vague, the game comes with a tutorial, so don't worry. There are tons and tons of puzzles in this game, and even a lot of downloadable puzzles as well! You can make your own and share them with friends, too. The music and atmosphere are very simplistic and relaxing, making this a perfect game to settle down with after a busy day. The sheer variety of content in this game (and the content that is possible) is huge and you'll be playing this game for weeks and weeks, if not months or years. Now you can add videos, screenshots, or other images (cover scans, disc scans, etc.) 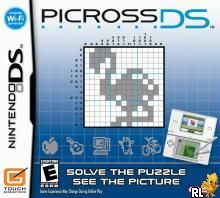 for Picross DS (U)(DOMiNENT) to Emuparadise. Do it now! If you haven't noticed yet, we have a retro game of the day feature (top-right of the screen) wherein we feature a new retro title every single day! Now, you can vote for your favorite games and allow them to have their moment of glory. 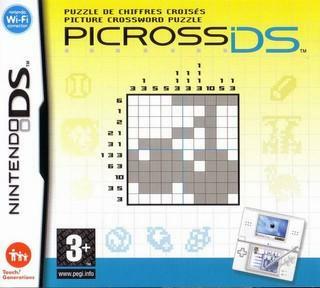 Click on the button below to nominate Picross DS (U)(DOMiNENT) for Retro Game of the Day.